So today I was sent home from work because I looked green. Needless to say, winter has given me a 'bug' - fabulous. However I turned this unfortunateness into an excuse to start off my blog again. As I was travelling home, wallowing in my own self pity, I thought about what would make me feel better. A bath? A nap? A massive dose of codeine? I mean yes this would all help, codeine is the stuff of dreams, but I had an overwhelming urge to spruce myself up with a bit of make-up. Obviously in an ideal world when you are ill (/hungover) you would be curled up in bed with not an inch of slap on your face. However sometimes you have to leave the house for work or some other equally crappy reason - girl's got bills to pay! 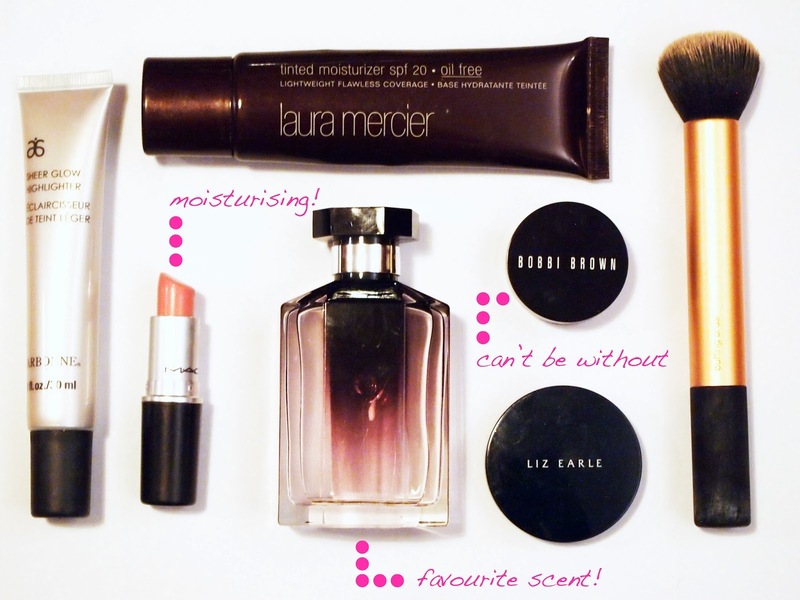 So I thought I'd put together a step-by-step of my 'you will feel better, damn you' make-up routine. 01// First off is the Bobbi Brown Corrector (mine is in Light Bisque). This is an absolute god send for dark under eye circles. I've raved about it before and I will rave about it again. It has a pinky tone that neutralises that nasty purple - hiding a multitude of late nights and early mornings. I just my fingers to apply, not just because I am the ultimate lazy gurl but also because it warms up the concealers so it is easier to blend. I pop it all on my under eye area and a bit on the lid. 03// Here you can see me applying with the Real Techniques Buffing Brush in an original buffing motion. 04// Ahh highlighter. My new friend when it comes to pretending I'm super perky. This time I used my Arbonne Sheer Glow Highlighter just in the corner of my eyes to brighten them up. 05// Applying with my fingers yet again, just too darn easy. 06// My second weapon when fighting 'murgh' skin is some blusher. I used Liz Earle's Healthy Glow Cream Blush as it gives a nice blendable, subtly colour. 07// I then made a weird squished face. 08// Finally I finish with some lipstick. I went for MAC Cremesheen Lipstick in Creme Cup as it is not too drying and the colour is pretty subtle - which means that when it half comes off and I'm too sicky to re-apply, no one will know! To complete the routine I spritz a bit of my favourite perfume - Stella by Stella McCartney. Your favourite scent is always going to uplight you...and perhaps mask the smell of last night's tequila shots. So there we go, my first blog post in a long long time. Hopefully this has broken the ice and I will now get back into the swing of it. Hopefully.